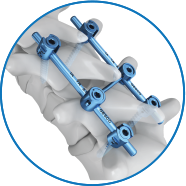 Alpha is a versatile 5.5 mm top-loading pedicle screw system with the versatility to accommodate complex spinal procedures. Alpha FEN is a 5.5mm top-loading cement augmentable fenestrated pedicle screw system for fixation of osteoporotic spine. Bean cage is a Thoracolumbar interbody cage that is used for TLIF procedures and can be implanted through a minimally access approach. 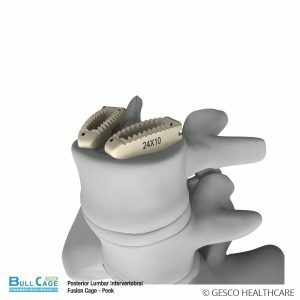 Bull Cage PEEK is a PEEK Thoracolumbar interbody cage that is used for Posterior Lumbar Interbody Fusion procedures (PLIF). Cygnet is a pediatric deformity correction spinal system that consists of very low profile pedicle screws to avoid protrusion. DAS is a Lumbar expandable corpectomy cage that can be expanded in-situ in a controlled manner. ETHAN Dorso-lumbar is a mesh cage used for corpectomy in the Dorso-lumbar region. Krypton is a universal system for the stable fixation and instrumental reduction of complex deformities in the thoracic and lumbar spine. The Ballon Kyphoplasty System is used to fix Vertebral Compression Fractures (VCFs). Magnum is a minimally invasive 5.5 mm pedicle screw system.